As part of my efforts to put together a vintage amateur radio station (more vintage than my Drake TR-4 station), I needed a transmit/receive relay. In the baroque terminology of vintage radio, Dow-Key is a term somewhat like Kleenex, misappropriated to mean "external T/R relay". Dow-Key is properly a company that has made various products over the years (starting, as one might guess, with telegraph keys), but in the world of amateur radio a "dow-key" almost invariably means an external T/R switch. Note: A concerned reader contacted me to clarify that a proper Dow-Key coaxial relay is a much more sophisticated piece of equipment than the item in this article. This is absolutely true. A Dow-Key brand relay (at least, the later models) is impedance-preserving, has improved isolation characteristics, and separates the relay coil and mechanics from the transmission lines to avoid cross-talk and switching noise. It appears that the use of the (lowercase) term "dow-key" as a generic term to indicate any coaxial relay is not universal. If it doesn't apply in your locale, substitute "coax relay" where "dow-key" is used in this article! Vintage radio stations often consist of a separate receiver and transmitter. This in turn necessitates more complicated connections than would be required by a modern transceiver. In many (but not all) cases, neither the transmitter nor receiver contains circuitry for switching a shared antenna between the separate devices. Modern stations, performing both functions in the same unit, have internal circuitry that patches the antenna through to the receiver when listening, and the transmitter when sending. Vintage stations often require a separate device for this — the dow-key. Interacting with the dow-key requires extra connections to both the transmitter and receiver. Vintage transmitters normally have either a set of relay contacts or a 110 V outlet on the back panel (sometimes both) intended to key an external T/R relay. Vintage receivers very often have a muting circuit with a pair of contacts on the back that can be opened (or sometimes shorted) to prevent even rather strong signals from passing through the receive path. (I had to fix the muting circuit on a Drake 2-B and wrote it up.) The external dow-key uses these contacts on the transmitter to connect the antenna to the appropriate device, as well as to simultaneously actuate the muting circuit contacts on the receiver. This ensures both that the transmitter has access to the antenna when it needs it, and that the extremely strong local signal does not damage the receiver or cause annoying feedback. Figure 1. Connection side of the completed dow-key. A vintage dow-key is an extremely simple device. They normally consist of nothing more than a relay and some wiring and associated connectors. 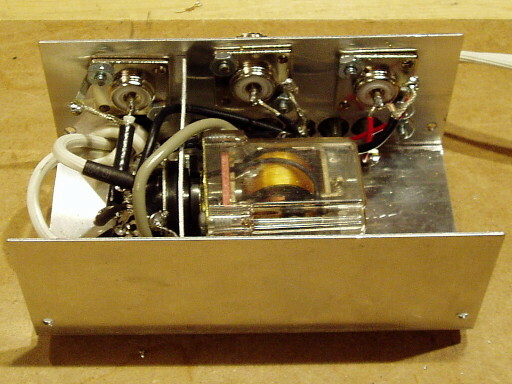 In this case, I used a combination of new, new old stock (NOS), and salvaged parts to build a DPDT dow-key with transmit, receive, and antenna RF connectors, receive RF screw terminals (many vintage receivers have screw terminal antenna connections), and both normally-open and normally-closed muting circuit screw terminals. Figure 1 shows the connector side of the completed dow-key. The SO-239 jacks, from left to right, are receiver, antenna, and transmitter. The antenna is connected to the center contact on one half of the DPDT relay, and the receiver jack is on its normally-closed contact. The transmitter jack is on the corresponding normally-open contact, and is connected when 120 VAC is applied to the power connector. The power connector is a molded plug and line cord cut off a new extension cord from a big box store — this is a great way to get high quality molded plugs on 6-10&apos; of zip cord for just a couple of dollars. The five-position screw terminal strip is a NOS part from Radio Daze. Its terminals, from left to right, are receive antenna signal, antenna ground, N/C mute contact, mute center contact, and N/C mute contact. Exposing both the N/O and N/C contacts from the second half of the DPDT relay allows this unit to be used with receivers requiring either arrangement, although all of the receivers I currently own use the normally-closed contacts. 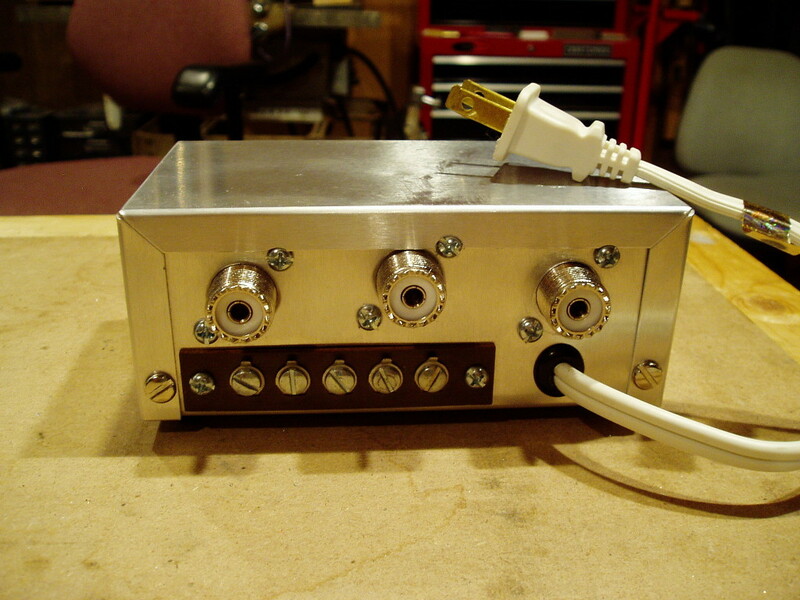 The case is a $4 aluminum project box from Radio Shack. Figure 2. Inside view of the completed dow-key. The interior construction of the unit is visible in Figure 2. The relay is a salvaged octal DPDT relay with a 120 VAC coil. Its socket and the aluminum L bracket to which it is mounted were salvaged with it. The transmitter and antenna jacks are wired with RG-58A/U coaxial cable, and the receive jack is wired with RG-178. The muting contacts are connected by a short length of salvaged four-conductor telephone wire. Shrink tubing is used sparingly (for example, on the 120 V line cord and its relay contacts). It would not have been used at all in a vintage dow-key (since it didn't exist), although spaghetti tubing might have been employed. In most cases, however, safety in vintage homebrew dow-keys and similar pieces of equipment is trusted to lead dress and a careful operator! 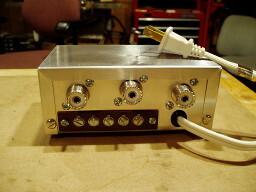 This dow-key was built specifically to get my Central Electronics 200V transmitter on the air with a Drake 2-B receiver. The 200V has a 120 VAC power outlet on the back for the purpose of actuating a dow-key directly, so this key uses a 120 V relay. However, many vintage transmitters provide only a pair of relay contacts that are shorted on transmit. The historical method of employing such contacts was to interrupt the hot line on the dow-key power cord, connect it across those contacts, and switch the relay by way of its line voltage. Since the contacts in question are almost always screw contacts with no meaningful protection, a prudent modern operator uses a low-voltage relay for this duty. I intend to build a second dow-key with an isolated low-voltage supply and a low-voltage relay for use with my CE 20-A exciter and other transmitters. It will be built in a Dynamic Metal Shop 5"x3.5"x1.5" enclosure (see the DMS eBay Store for the enclosures they have on hand) and use a 12.6 V filament transformer for isolation. I chose not to use this tactic for the 200V (though it does also provide relay contacts suitable for this purpose) to save the extra set of wires and additional contacts on the dow-key. I would, however, only consider this dow-key "safe" for the 200V, of the radios in my collection, and only because it provides a proper power outlet on the rear panel. Disclaimer: While I have no financial interest in DMS or their enclosures, I do know some of their employees personally. I happen to think their enclosures are top notch!